When I saw the Paper Players' banner this week, I knew I wanted to enter their colour challenge and I knew I wanted to water colour, but I needed to find a suitable image. After looking over my stash, I came across one that hasn't had the love it should have had lately, Rose Wonder. 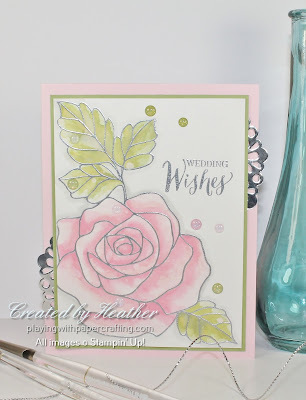 This one has been around since the 2016 Occasions Catalogue and was one of Stampin' Up! 's first more intricate stamp/thinlit bundles. Anyway it's a lovely image to emboss and then watercolour, so I did just that. Now anyone who reads my blog regularly knows that I am a pretty loyal Stampin' Up! demonstrator, but I have been really intrigued and curious about the new Ranger Oxide inks and I just had to get a few of them to try them out. I love that they are opaque and that they react with water in such an awesome way, creating such vibrant colour. Stampin' Up! does not yet carry anything like them. I finally had a chance to play around with them here. 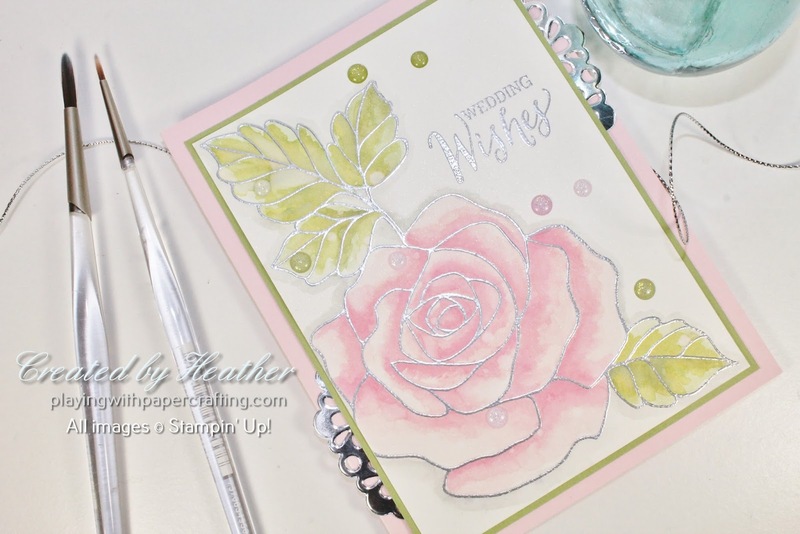 The Worn Lipstick and the Peeled Paint colours were a perfect compliment to my base colours of Pink Pirouette and Pear Pizzazz and just added some depth and fun to my water colouring. 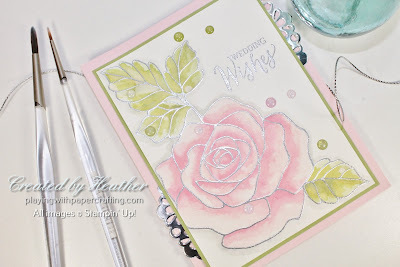 Since the Rose Wonder stamp set is over a year old, (introduced, as I said, in the 2016 Occasions catalogue, January 2016) I thought I would also enter in the Retro Rubber "Anything Goes" challenge. I inked up my image and my sentiment in Versamark and embossed both using Silver Stampin' Emboss Powder on Shimmery White cardstock. I chose the Shimmery White because I was planning to watercolour and it allows you to do that without the paper pilling and soaking up too much water too quickly. I laid down a base layer of Pink Pirouette and Pear Pizzazz, using an Aqua Painter and squeezing the top and bottom of the ink pad together to get some ink in the lid of the stamp pad to use with the aqua painter. Once the base layer dried, I added more shading around the base of the petals and in the creases of the leaves, using more Pink Pirouette and Pear Pizzazz die layered over top. When that was dried, helped along by the Heat Tool, I got out the Ranger Oxide inks. I rubbed some on a clear block, straight from the ink pad and used that with the Aqua Painter. It painted on really well with water as its solvent. It added a final layer of vibrant shadow and dimension. When that was dry, as well, I sprinkled it with drops of water and used a tissue to blot them after about half a minute. It left some great water droplet texture on the petals and leaves. With the oxide inks, it is a much less subtle effect than with our dye inks. 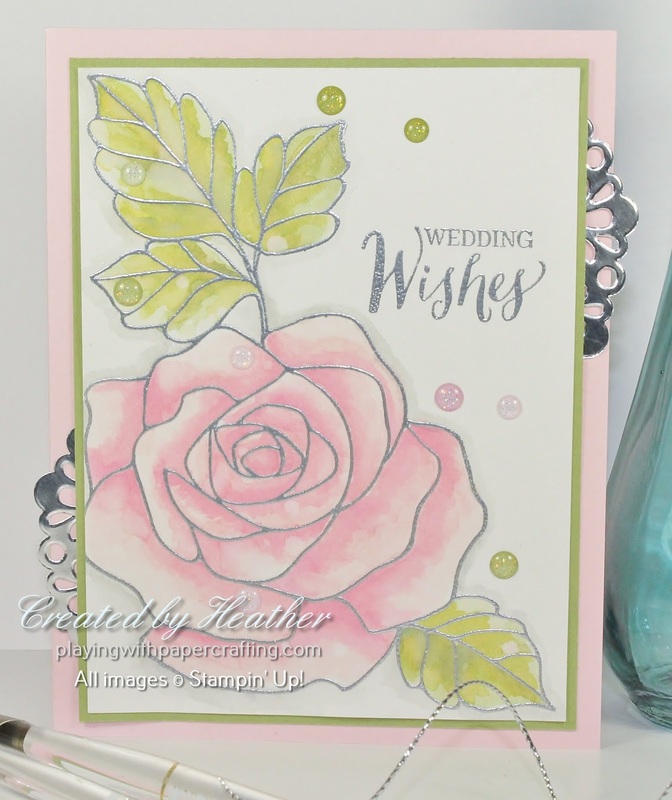 I added some of our Glitter Enamel Dots, the lighter ones looking just like dew drops on the flower and the darker ones providing some contrast and balance to the design. A silver Metallic Foil Doily, cut in half and glued as shown, offset to each side of the main panel, adds a stronger note of silver and some extra interest to the design. If you didn't take advantage of the last promotion, there is lots of time to take advantage of this one. And you don't need to be a new subscriber. You could be a current subscriber, or one who has cancelled for awhile. You just need to reactive your account. Go to PaperPumpkin.com to do that!